My mom has made this for years. It's a family favorite, and a salad that can serve as your meal, and a fool-proof way to impress company. Break lettuce into bite-sized pieces. The recipe calls for a head and a half of iceburg, but I like to use one head of iceburg and some romaine. The romaine adds dark leaf for health and color. I like iceburg as the base though because it's the perfect cool, crunchy lettuce this recipe needs. 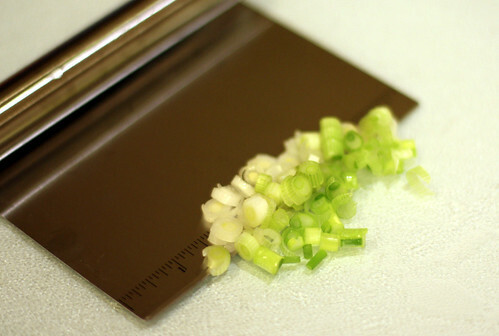 I love to slice green onions. The smell reminds me of the lower playground at Roosevelt Elementary School. The hillside surrounding the field was covered in wild onions in the spring, and my friends and I would climb up and pick them. Some kids would eat them but I never did. Toss together chicken, green onions, almonds, poppy seeds, and noodles. In a small bowl whisk together sugar, salt, pepper, vinegar, and oil. Pour dressing over chicken mixture and toss with the lettuce. Enter to win a DVD of Fantastic Mr. Fox and/or Amelia. Yummy sounds so good! Thanks for the recipe I have had something similar with little orange slice in it.Have a wonderful Monday! This sounds like a "Keeper"! Thanks for sharing! I don't normally consider salad as a meal but that does look tasty and I've already eaten lunch yet I'm now drooling. Frau - I love fruit in a salad! Mary - We've kept it for maybe 20 years now? It is a keeper! mo - The trick is having one chicken breast per person. Then you feel like you've eaten a good meal. That looks so good! I'm definitely going to put it on the menu for next week. nom nom!!!! 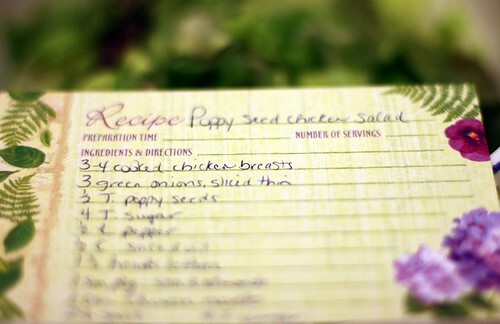 that sounds delish< Amy i love the recipe card included!!!!! This will be my new spring fav!! I wonder if fruits (strawberry, pineapple, oranges) would be yummy on this? 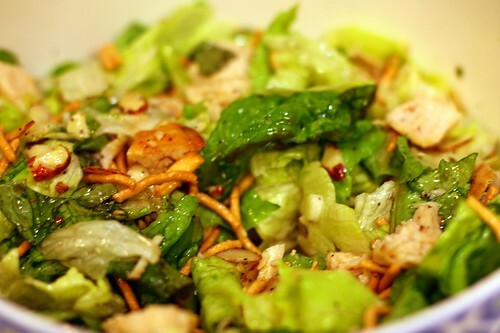 In the summer, Panera has a salad similar, and it is truly amazing! Now there are two salads of yours I want to make. This looks really good to me. More and more it seems we have similar tastebuds! I agree that the recipe card photo was a nice touch. Mmmm...I just stumbled upon your blog. This recipe looks DELICIOUS. Definitely printing this one out. :) Thanks!